Game of seals. The heat is close! How to survive the summer heat? Go on an exciting journey with the Pure Line. 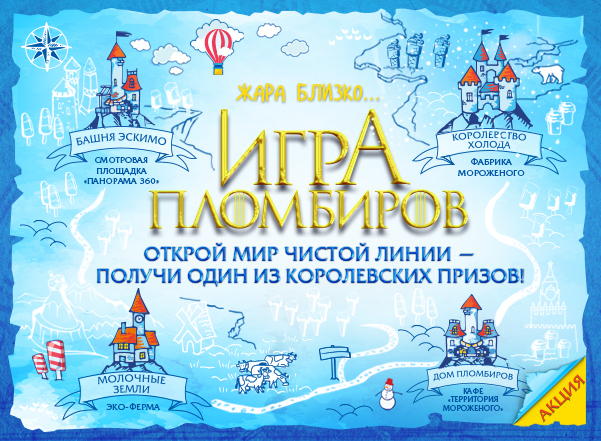 “Plombir game” is a sea of ice cream, great prizes and real summer adventures. The promotion is held from June 1 to August 31, 2018 in Moscow and St. Petersburg. Hurry to overcome the heat! Eat ice cream and win! Buy cups or horns Clean Line with a special mark about the action. Inside each promo ice cream you will find a promo code. Check out the promo code on www.igraplombirov.ru to find out your prize. amount of 500 rubles. at the address Moscow, Tverskaya 5/6). Trekking to the Dairy Lands (excursion to the eco-farm Chistaya Liniya in the village of Klusovo Moscow region). Residents of St. Petersburg can replace a visit to a factory, cafes, farms and towers at an equivalent in value ice cream reserve. Ready for more serious tests? Go on a real journey through the lands of the Clean Line and get a guaranteed prize! Visit the corporate attractions of the Pure Line: a farm, a factory, an observation deck and a cafe. When visiting each object, mark the map. A real paper map you will find at any of the points. Presnenskaya nab., 2, shopping center “Afimall”). Visit the points in any convenient order. Have time to go through until August 31,2018.
will also see the capital from a bird’s eye view. In the ticket unlimited eating of a seal! We will answer your questions by phone 8-800-550-73-02.